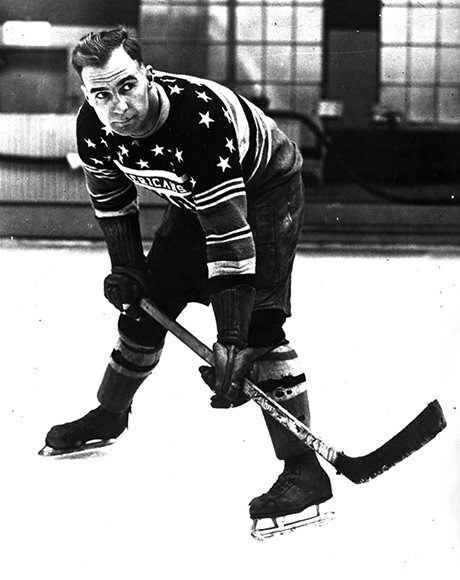 Lionel Conacher (1900-54) was reputedly the greatest all-round athlete Canada has ever produced. As a child, he was obsessed by the desire to excel in sports and, taking up football, lacrosse, wrestling, hockey and baseball, he developed remarkable endurance and superb physical skills. In 1920, Conacher won the Canadian light-heavyweight boxing championship, and the following year he led the Toronto Argonauts to a Grey Cup victory. "The Big Train" then devoted himself to professional hockey. A defenceman for National Hockey League teams in Pittsburgh, New York, Montreal and Chicago, he gained a reputation as an aggressive player and a brilliant tactician. In 1937, Conacher retired from professional sports. Thirteen years later, he was named the outstanding Canadian male athlete of the half-century by The Canadian Press. “The average kid starts skating at the age of seven years or younger … I laced on skates for the first time at the age of 16 and you’ll never know the humiliation and utter dreariness of the long hours which I spent on rinks with younger and more skilled players before I won a post in junior circles.” Big Train: The Legendary Ironman of Sport, Lionel Conacher, by Richard Brignall. Visit the Canada’s Sports Hall of Fame website to learn more about Conacher and the award for male athlete of the year named in his honour. Watch Historica Canada’s Heritage Minutes video on Conacher.